Made in Maine, this men’s front pocket wallet has some advantages over the typical back pocket style. 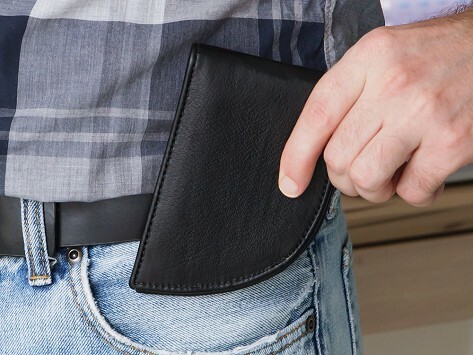 It’s safer to carry your billfold in the front, and can also be less stressful for your back. With its curved, slim design, this bison leather wallet fits perfectly into a front pocket, carrying both cash and cards comfortably. For extra protection, it has RFID blockers stitched in. I love the front pocket design and the very high quality workmanship, but even though I ordered the wallet for six cards, I still found this to be too small to store all of the stuff that I have in my old wallet. I think this would work best for people who don't carry a lot of cards. Wallet is so comfortable and easy to remove from pocket. Great idea. Saves your back to not have it in the back pocket.